Endorphin is derived from endorphins, a natural substance a positive life energy that every living thing naturally creates and encourages the delivery of exceptional performance. We do feel with our senses, one of the most important human qualities often our forgotten intuitive ability. Registration of our feelings and experiences are passed through our energy pathways, our nervous system to our personal computer, our brains. Our feelings, also called energy incentives, can be, both positive and negative. By past experiences, our feelings are blocked at some levels, so our energy pathways no longer function optimally. Our body has many energy centers, the intersections of our nerves with its center in our brains, which acts as a memory bank, where without us realizing it or want to know everything is stored. Our body has seven main nerve nodes, all connected to our spinal cord, the main energy artery, the carrier of information to our brains. 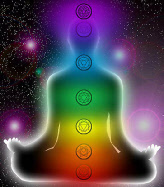 It is no coincidence that the seven main nerve centers in our body correspond to the seven basic chakras and the seven basic colors of our aura.